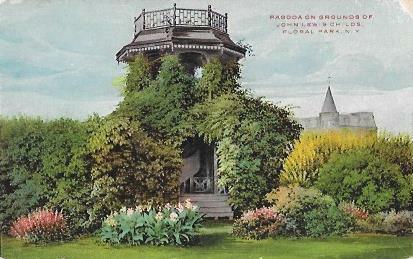 Pagoda on the Grounds of John Lewis Childs, Floral Park, N.Y.
View of a pagoda, which is surrounded by plants and flowers, on the grounds of John Lewis Child. The top portion of the seed house is visible in the background, at right. The Childs family coat of arms is printed on the verso, in the center top portion of the area designated for a message. 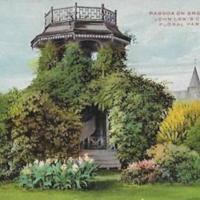 “Pagoda on the Grounds of John Lewis Childs, Floral Park, N.Y.,” Hofstra University Library Special Collections: Digital Collections, accessed April 21, 2019, https://omeka.hofstra.edu/items/show/1828.